Our range of products include baby bassinet (general) and ambu bags. Artificial Resuscitation with different masks. Ambu Bags offered comes in quality construction finish and can be made available in 3 size options like adult, child and infant. The product finds use in medical application involving pulmonary resuscitation are available in variations like adults and children, pediatric - children and infants and infant - infants and neonates. These bags also come supported by pressure limitation valve for patient safety as well as come with textured surface finish so as to ensure firm grip as well as meeting the demands of providing effective ventilation support. Used to provide positive pressure ventilation to patients who are not breathing or not breathing adequately. Available in Infant, Child & Adult sizes. 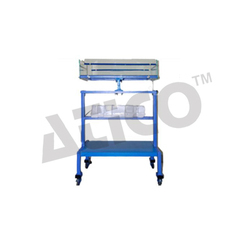 Advanced Technocracy Inc.manufacturer, supplier and Exporter of Ambu Bags. Ambu Bags offered comes in quality construction finish and features presence of pressure limitation valve for achieving optimum patient safety. Further, the superior textured finish provided on its surface also provide for a firm gripping support as well as meets the demands of effective ventilation. 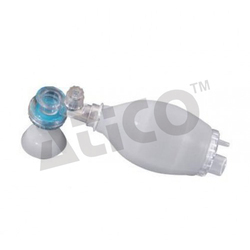 Some of its features include patient connector support of Ø22/15 mm, 100% latex free, comes with accessories support including reservoir bag, oxygen tubing, durable construction finish among others. 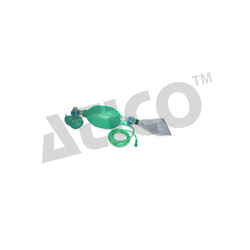 Self Inflating Double Ended Silicone Bag(1600ml) with mounts, inbuilt reservoir valve and side oxygen inlet, "L" type non-rebreathing valve, Mask Size "04" Clearhood facemask, Corrugated pipe for air oxygen mixing, 1.5 mtrs oxygen tubing, reservoir bag 2600ml for 100 % oxygen enrichment. Looking for Infant Care ?